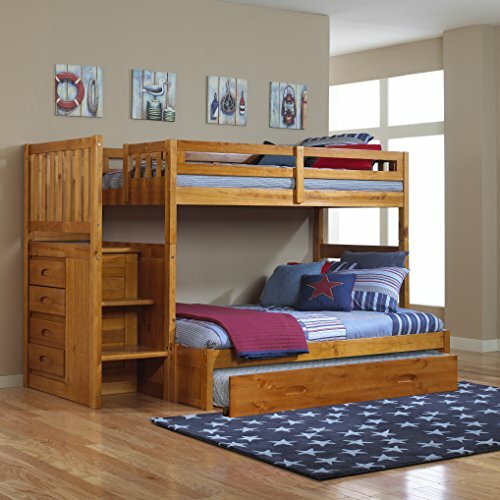 A trundle bed is a popular option for a kid's room, guest room, or even a small main bedroom. But what are they? And are there different types? We break down the mystique in this handy guide to trundle beds and their uses. Thinking about investing in a trundle bed? 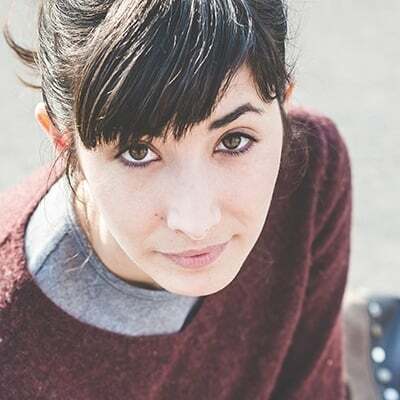 Wondering which type you should get and whether it’s a good purchase for your needs? We can help. A trundle bed is a small bed that you store underneath your ordinary bed and wheel out on rollers or casters when you have visitors. They are an innovative way to save room in your apartment, especially if you live in a studio or other small space. They’re a good choice for people with big families or multiple roommates in close living quarters. You may also use a trundle bed as an extra main bed, as they offer you two sleeping spots in one piece of furniture and take up half as much space as two beds would. First used in the 16th century, the original trundle bed was made with oak and used suspension made of leather or canvas straps. Who can Benefit from a Trundle Bed? The small second pull-out in a trundle bed typically has a thin mattress compared to the main bed, so they’re more suitable for temporary guests, small children, and teenagers. These beds are closer to the ground than an ordinary mattress and don’t offer quite as much support. Because of this lesser support, trundle beds aren’t suitable for people with mobility issues (like arthritis) or elderly people. What are Trundle Beds Made of? Trundle beds are usually made with some combination of standard bed materials, like upholstery, metal, and wood. The type of bed frame you’ll select for yours will depend on the style you want. Since they’re meant to accommodate small living spaces, trundle beds are only available in a couple of sizes and usually come in either Twin or Full. Why Buy a Trundle Bed? Again, the main reason people use trundle beds is to save room. In addition, you can use a trundle bed as a daybed or lounge space during the day, as it’s similar to a couch in size. As soon as you need to use a trundle bed as a sleeping area, just roll the second bed out and add some pillows and bedding. Trundle beds come in various styles and some include drawers for storing the bedding and pillows when they’re not in use. Which Type of Mattress Should You Use with a Trundle Bed? When it comes to the upper mattress on a trundle bed, you can select any mattress type you want. The lower mattress, however, usually shouldn’t be thicker than 10 inches. Always make sure you check specific measurements before you buy a mattress for your bed. Since you’ll need to use your trundle bed without a box spring (as it won’t fit), it’s best to get a mattress type that’s supportive on its own, such as a memory foam bed. Trundle beds are easy to find online or in local stores, but there are many different types of models out there to choose from. 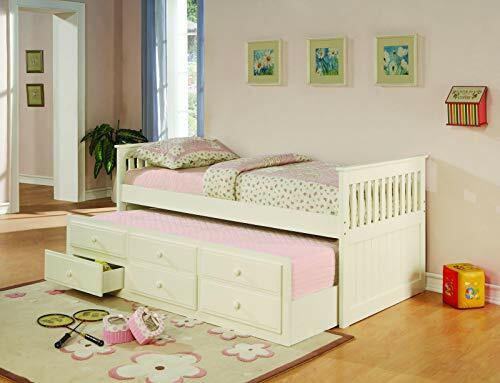 Ideal for homeowners who need three sleeping spaces in one small area, bunk beds with a trundle work well for people with multiple children sharing one room. These offer a maximum amount of space-saving, as it literally stacks three beds into one small area. 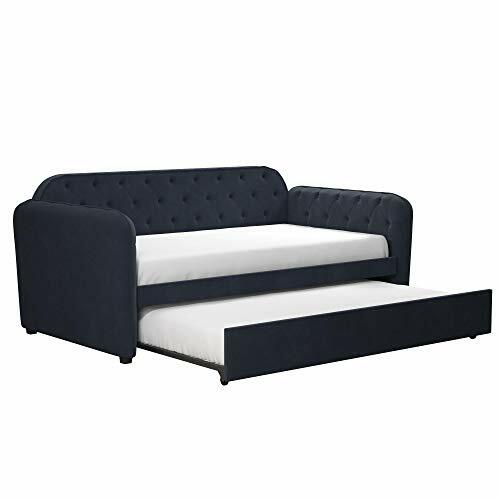 Another option is a trundle daybed that you can convert into a small couch or sofa during the day. People with small living areas will benefit from the versatility offered by this type of trundle bed, as you’ll have somewhere to sit during the day and somewhere to sleep at night in just one piece of furniture. These will also typically be easier to operate than pull-out sofa beds. If you need some additional storage space, you might want to consider a trundle bed with drawers for storing your items. This option will often have a frame similar to a low dresser. You can use the drawers to store bed linen when the trundle isn’t in use, or just for ordinary household items you don’t have room to put anywhere else. Transitioning to a real bed: Some kids have trouble switching to an ordinary bed after leaving the crib or toddler bed. A trundle bed can provide you with a transition bed for them to use, where they can be close to you. Housing relatives: If you have a small living space, it can be a challenge to host relatives for holidays. A trundle bed is a potential solution to this issue and will give you space for another couple of people. Sleepovers: Trundles are very useful for kids or teenagers who want to have friends over with limited space in their room. Even in small living spaces, you can still host a sleepover, especially with a bunk trundle bed. Office use: If you have a multi-purpose extra room, a trundle daybed can be a useful addition to your home office. Use it as an extra sitting area during the day and a place to sleep at night for you or your guests. As you can see, trundle beds are a helpful product to have around and have many different uses. People who live in large, expensive cities with cramped living spaces will likely benefit the most from this type of product. Whichever style you end up getting, trundle beds are a timeless addition to your living space and can be used for storage, sleeping, or even as decoration. They’re simple to use, don’t take up much room, and can change your apartment or house for the better. PrevPreviousTempur-Pedic Symphony Pillow Review 2019: Is This Dual-Sided Memory Foam Pillow Right For You?